A quasicrystal made from tiny Penrose tiles that undergo Brownian motion has been created by Po-Yuan Wang and Thomas Mason at the University of California-Los Angeles. The duo was able to track changes in the 2D structure as tiles moved around, observing a range of effects including melting. 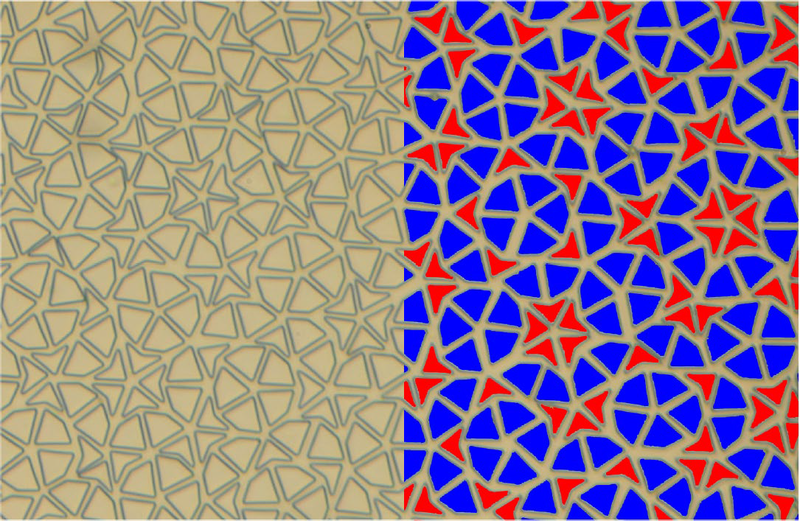 As well as shedding further light on the properties of quasicrystals, the new lithographic fabrication technique could be used to study a wide range of colloidal systems. Until relatively recently, scientists had assumed that all crystals have translational symmetry. This means they comprise a periodically-repeating unit cell of atoms that fills space without any voids. 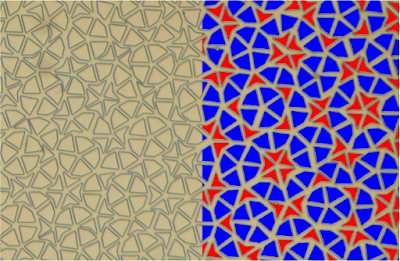 In contrast, quasicrystals do not have translational symmetry – they possess rotational symmetry – but also fill space without any voids. The unexpected discovery of quasicrystalline materials was made in 1984 by the Israeli materials engineer Dan Shechtman, who was later awarded the 2011 Nobel Prize for Chemistry. Although the discovery was first met with skepticism, hundreds of solid-state quasicrystals have since been discovered. Furthermore, researchers are looking at potential applications of quasicrystals that range from aerospace to coatings of surgical and kitchen utensils.